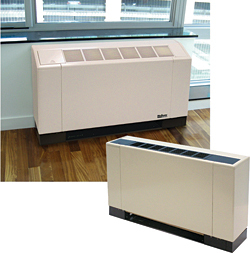 Heat Pump is selectable for standard, boiler/tower or geothermal applications and uses R-410A refrigerant. Designed for in-room installation, the Enfinity console water source heat pumps allow for stand-alone thermostat operation for integration with any building automation system using LONWORKS or BACnet communications. Available in a flat- or sloped-top cabinet with one front and two side access panels.